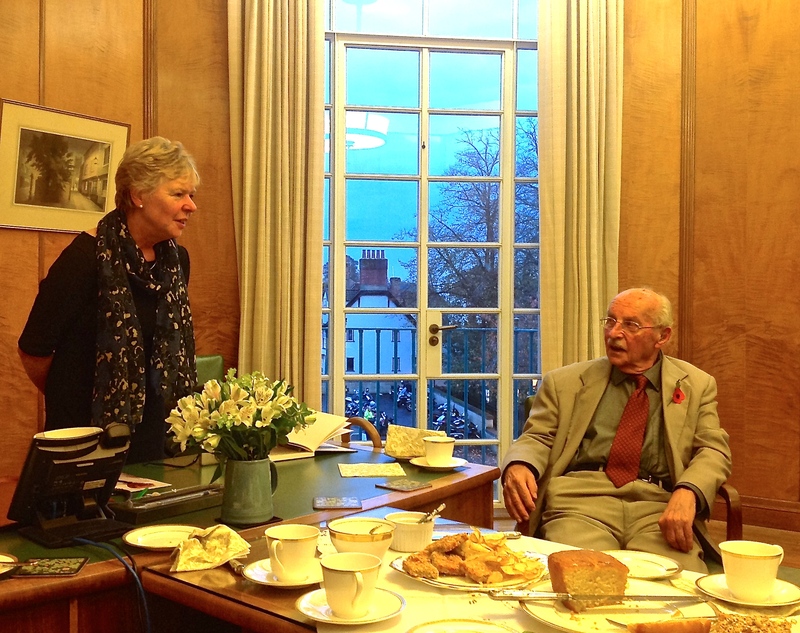 On Monday 10th November I was privileged to join Joe and members of his family at a Tea Party in honour of his 90th birthday, hosted by the Lord Mayor of Norwich, Councillor Judith Lubbock. The Parlour is a beautiful Art Nouveau room with Canadian Maple panelling, her own facilities, a little kitchen and a wonderful view over the Market Place and up to the Castle. The walls are covered in old paintings of Norwich landmarks. The Mayor had baked a delicious lemon drizzle cake and some flapjacks, and as ever the tea tasted so much better out of fine porcelain cups. Joe had a lovely time as patriarch and the conversation was wide reaching. I am only sorry that my book will not be published while Councillor Lubbock is still Mayor, but with Joe’s long time connections with the City Council, I am trusting that the next Mayor will be as supportive of the project. It was a lovely afternoon. Thanks to the Lord Mayor for her hospitality.